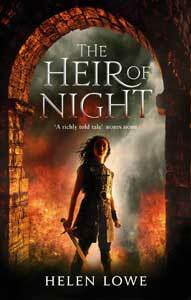 Today I am very pleased to bring you another SFF review from regular “…on Anything, Really” reviewer, Andrew Robins. Great North Road is a standalone story that takes shape in what starts as a not too distant, not too unrecognizable 22nd Century. The back cover sells this book as a murder mystery, and in one sense that is exactly what the story is—a well-conceived, well-told story about a high stakes investigation into an intriguing murder. This element of the story dominates the first half of the book, and remains strong throughout. So if you like a good murder mystery, you will like this book. But in reality (at least in my view) this is a first contact story. Readers familiar with Peter F Hamilton’s Commonwealth Saga will notice some similarities in the technology-driven elements to the story told in Great North Road. There are also some similarities between the societies that have emerged, and the issues they face. For example, both stories feature “gate” technology that is under the control of the rich and powerful families, who are in the business of getting richer and becoming even more powerful. These similarities may annoy some readers, but they were not an issue for me. The canvas Peter F Hamilton is painting on is vast — and in my view there is more than enough room to repeat some themes and still tell a fresh and engaging story. I loved the two main characters, Sidney Hurst, and Angela Tramelo. Both characters are smart and have plenty of agency within the story. Angela has an incredibly rich backstory that is revealed progressively throughout the book, and really is the element that links all of the diverse plot threads together. As I mention above, some readers might find the similarities between this story and some of Peter F Hamilton’s other work to be pretty strong, for what is supposed to be a story set in a fresh universe. This was not an issue for me, but is worth noting here. A bigger issue for me is around issues of power and control, as revealed in some of the relationships between male and female characters in the story. Not to put too fine a point on it, Peter F Hamilton is a fan of exploring what happens when strong, attractive, intelligent young women choose to put themselves in the power of wealthy and powerful older men. In Great North Road this is deftly done, and for the most part the women involved have good reasons for being where they are, and doing what they are doing. It works for the story that is being told, and for the characters that are being developed. Nonetheless I did find this aspect of the story a little wearing and I would love to see the characters’ collective journey explored in other ways. Overall though, this is a well told and engaging story, that grabbed and retained my interest. Great North Road also features great characters with just enough character flaws to make them really interesting. Peter F Hamilton remains a creative force to be reckoned with, and I look forward to his next book. 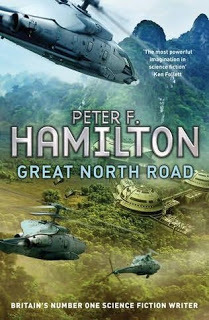 Readers who like Peter F Hamilton’s other work, and also Larry Niven’s “Gil The Arm” (Gil Hamilton) books will almost certainly enjoy Great North Road. To read more reviews by Andrew, see “Book Reviews for ‘on Anything, Really’” in the right-hand, side bar.